As with many other media policy issues, many Americans are not conscious of how Federal Communications Commission (FCC) regulation changes could affect their daily lives. As large media content producing companies try to combine, even owners of local television stations are looking to converge in order to cut costs and make money. The most relevant example of this is the Sinclair Broadcast Group wanting to take ownership of Tribune Media, which owns 42 local television stations. This acquisition would bring Sinclair’s total ownership to 233 stations after the proposed acquisition. The implications of this with regard to diversity of media is another debate; the issue in this article is the FCC’s rollback of something called the “main studio rule” and it is inherently related to the convergence in ownership of media, a trend in the market since 1996. Announced on Tuesday, October 24th, the FCC voted to repeal the main studio rule, which has major implications on those in rural America. It was first put in place in 1940 and required that FCC licensed broadcasting stations must be located in the area producing content (e.g. a radio show or local TV news show). This ensured that most local areas has a nearby station that people could go to and that the news of the area was actually spread, rather than just national news or statewide news. After all, national issues do affect Americans as a collective, but many believe that local issues have a greater impact on day-to-day life. Pew Research Center notes that while local television news viewership is declining, it still garners more viewers than both network news and cable news. 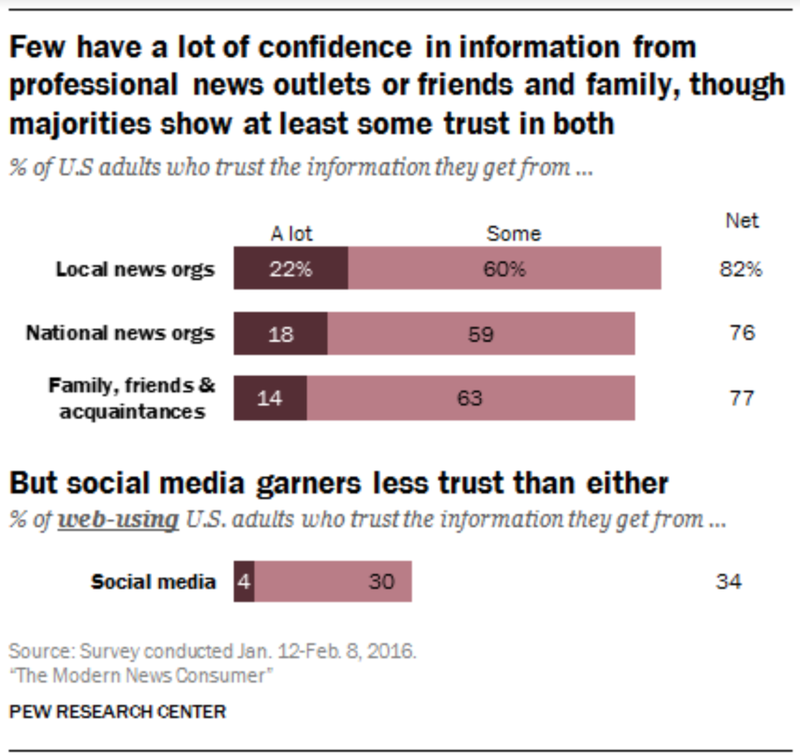 Furthermore, it is important to note that Pew has found that adults trust local news more than both national news and news coming from friends and family. So even though the viewership remains high, companies still have an interest in making money by cutting costs. With the FCC eliminating the main studio rule, it allows companies like Sinclair to downsize the number of studios to save money. With this rule gone, companies like Sinclair can eliminate entire stations in smaller communities and simply transmit the news from a larger station. This means that if one company owned stations in Richmond and the surrounding communities like Charlottesville and Williamsburg, they could eliminate local news stations in Charlottesville and Williamsburg and simply rebroadcast the news coming out of Richmond. This is a major problem because the local reporting of news in the smaller communities either happens less now than before, or is not happening at all. Companies like Sinclair can argue that they do this to create higher quality news for everyone in the area. That argument falls flat when you consider the fact that local news gets roughly 30 minutes every evening to cover its individual community, or potentially three communities if we use the theoretical conglomerate above. The FCC argues that because people gather news off of social media and the internet more generally, the need for radio and TV to have local stations is much less than it once was. There is some truth to this; Pew has shown people are turning to the internet more and more for news. However the internet is still not the major source that Americans use for any news, let alone local news. Sinclair Broadcasting Group is the prime example for the consolidation of local news and, for many Americans, is a sole source for local news. This conglomerate is not shy about showing the market that they own-there’s even a map on their website which reveals their ownership of four stations in Virginia. Bristol, Lynchburg, Richmond, and Norfolk all have a Sinclair owned station. If Sinclair acquires Tribune, they would add one station in Richmond and Norfolk to their ownership as well. This very real possibility for media owners rebroadcasting news for all or some of Virginia rather than showing local news for each station isn’t far-fetched, and could really blindside many rural Americans, especially those in South and Southwest Virginia. Those rural communities are more at risk for this because of the size of the market in relation to a larger city. The costs of broadcasting in a rural area are higher and, when combined with rural America’s lack of internet access, one could see how large sects of Americans will be left behind. Additionally, on October 26th, FCC Chairman Ajit Pai announced the FCC plans to reverse even more ownership rules for local markets. The result of rolling back these regulations could create a competitive market like Pai claims, but they could also allow companies like Sinclair to buy up more and more stations to have oligopolistic control over the market. Even given the trend towards consolidation and deregulation making this easier, I doubt the market has much potential to be competitive. It would be like a toddler trying to swim against Michael Phelps and suddenly they’re both allowed to take steroids. Michael Phelps still wins the race. Sinclair still wins its bids for buying stations in markets they weren’t allowed to reach into before. The FCC formally announced the repeal of long standing ownership rules for local markets on November 16th. The commission will now allow companies to own 2 of the top 4 stations in a market as well as own newspapers in addition to television stations. These changes will greatly affect the market of local news in the way that the diversity of ownership could lessen, if trends of consolidation continue..
All of this comes back to the question of how this will change local TV news. If one company exerts control over news in the local market, then there may be no diversity of news in that area--or potentially no news at all since there is now no main studio rule. Sinclair’s audiences are not the only ones that could fall victim to these problems. There are similar companies with similar power like Nexstar (171 stations), Gray Television (93 stations), and many others. The threat of local TV news failing to inform consumers is very possible and would drastically change the news environment as a whole.